My last healthy obsession, green tea, has become a staple in our home. 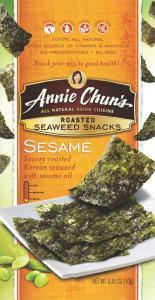 And now without even trying I’ve added another one: Seaweed snacks. I occasionally catch a few minutes of Dr. Oz on weekday mornings (last winter I even attended a taping). A few weeks ago I caught a segment on the “miracle vegetable” seaweed (this article is the gist of the show segment). Dr. Oz tried to convince audience members that seaweed was tasty and not strange, and to try to include it in their diets, touting various kinds as skin and weight loss aids. I didn’t need convincing that I would like seaweed; I love (vegetarian) sushi and seaweed salad, but I probably only have them once every few months at most. What I didn’t know was that I could get a really delicious seaweed snack at my local grocery store for $1.50, and that it would help my dry (and acne-prone) skin. These seaweed snacks have become my new healthy obession. I could eat a package a day (although I try to pace myself a bit more than that). Click here for Nutritional Facts. My other new healthy is water. Everyone knows you are supposed to drink eight 8oz glasses of water a day, but realistically, even the healiest among us get to busy to remember to do it. And then there’s the coffee, tea, soda, wine, beer, etc. But oddly enough I’ve changed my habits to drink tons of water a day without trying, just by getting a new cup. 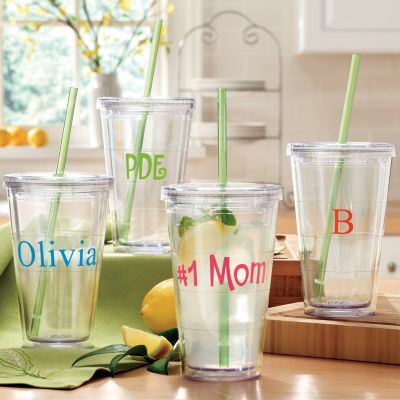 My fiance brought home a reusable plastic “to-go” type cup that he got for free at work (similar to the ones below), and I’m drinking from it constantly. It’s kind of like an adult sippy cup, but it works. Just goes to show it’s easy to make small changes to improve your health that don’t have to feel like work.